New! 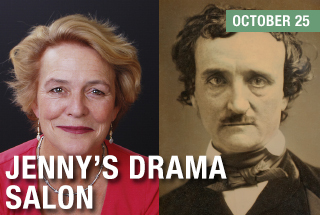 Jenny's Drama Salon: Playwright, actress and humor writer, Jenny Allen, presents a monthly drama salon, featuring casual dramatic readings, interesting guests, stimulating conversation and great brownies – all in the Marilyn Meyerhoff Lobby. For her October salon, please join Jenny for spooky storytelling with special guest Holly Nadler, author of "Haunted Island", along with readings from three under-10-minute plays based on Edgar Allen Poe stories. Come if you dare! $10 at the door includes coffee or tea and Halloween treats!